For those fascinated by religion from a historical perspective, the evolution and alteration of various terms over time is a captivating subject. Take for instance the word azazel, its earliest known use of being that of a Biblical scapegoat rite, the faithful annually transferring their sins into a sacrificial goat which was then expelled into the desert. But it resurfaced with a sinister meaning in apocryphal and even some canonical Judaist, Christian, and Islamic texts, the name Azazel twisted into association with a fallen angel, one frequently credited with teaching men the secrets of witchcraft. And it is this later usage that has taken hold in popular culture, reinforced by its appearance as a demonic entity in Neil Gaiman‘s Sandman series, as the true identity of the Yellow-Eyed Demon in the Supernatural television show, and most recently as the namesake of Jon-Paul Kaiser‘s Demon Dunny from Kidrobot, a piece continuing the popular Arcane Divination series. What is the Arcane Divination Series? Issued in May of 2017, Arcane Divination was a series “based on the twenty-two Major Arcana picture cards from the traditional seventy-eight card tarot deck”, explains collection curator Jesse Yu, “but because of the project limitations, we were only able to represent fifteen out of the twenty-two cards”. Interpreted through decorations and several sculptural modifications to Kidrobot’s 3-inch tall Dunny form, these factory-produced designs were conceived by Camilla d’Errico, Godmachine, Jon-Paul Kaiser, Tokyo Jesus, and Yu himself under his J★RYU alias. “Our study into Tarot wasn’t just wanting to interpret the classical representations of each card”, Yu admits, “but also the idea that humans have an innate desire to want to know their future, their fate.” And as for the fate of Arcane Divination, its critical acclaim and commercial success ensured a bright future for the concept. With the line having actually debuted with the J★RYU’s stand-alone 8-inch tall The Clairvoyant Dunny in 2016, with its accompanying crystal ball and Dunny hybrid, the demand for this series resulted in a larger 20-inch rendition of this creation in November of 2017 and a roughly 10-inch version of Godmachine’s Devil Dunny design in June of 2018. But, moreover, Kidrobot’s Creative Director “Frank Kozik greenlit the second series pretty much right after the release of the first series”, says Yu. Expected to be released in Spring of 2019, the follow-up series is titled Arcane Divination: The Lost Cards, “which will complete the entire twenty-two Major Arcana cards”, discloses Yu, “plus introduce five entirely new Tarot cards envisioned by each of the participating artists, [ones] that represent new archetypes that we hope will follow the spirit of Tarot”. Viewing “phase 1 and 2”, as Yu refers to the two collections, “as part of one mega series that just happened to be released at two different times”, this new set will include works by all the artists involved in the original Arcane Divination series save for Godmachine, whose participation is replaced by Doktor A. But how does Kaiser’s Azazel Dunny fit into this larger scheme? “Many collectors might be wondering why the Azazel 5″ Demon Dunny is considered part of the Arcane Divination line”, Yu admits, further explaining how “Kidrobot asked me to include two 5-inch Dunny designs in my plans for this second phase of Arcane Divination, sort of like how we had an 8-inch Dunny (The Clairvoyant) associated with the first series”. Clarifying that these were “designs to be produced in the spirit and aesthetic of what we had already established”, Yu reveals that this “darker, gothic romantic” atmosphere would become the hallmark of the Arcane Divination banner, forming a “sub-line or family” that is both visually and conceptually coherent. “When the entire family of designs is together, all the pieces should feel like they fit tonally into the same universe”, Yu elaborates, further stating that the “Azazel Demon [Dunny] is a strong design on its own but does contain some elements that fans of Arcane Divination will find familiar”, making it a perfect addition to the line as “a standalone design that does not have a complimentary 3-inch version”. So while the Azazel Dunny is “not linked to the Tarot theme of the 3-inch series”, Kaiser explains that “the Demon Dunny taps into the same vein of thought” as the original series, the artist specifying how it evokes those who “look towards the intangible to try and gain some kind of control over their life or destiny”. Viewing “this character as a simile for Prometheus“, Kaiser discloses that he interprets Azazel as “one who gifts mankind with knowledge and a fresh understanding of how to divine and control their future, but in doing so has broken trust with the powers above him”. Cast down from his state of grace and warped into demonic form for this infraction, Kaiser’s Azazel Dunny stands roughly 5-inches tall, a reoccurring key motif on the design harkens to the character’s history of unlocking secrets in the minds of men. “The Demon seeks to lure in those who are looking for a way out, an easy route to overcome their challenges”, as Kaiser describes it, “a perfect time for desperate measures to be considered, and alternative answers sought from a different kind of authority”. Emblazoned with a beautiful head modification, “the bat wings featured on the sculpt serve a dual purpose”, the artist admits, elaborating that it’s not only “to play with the conventions of the Dunny shape”, their ominous form careening upward on the normally cartoonish rabbit-like ears, but also to “reflect the wings of an angel”, a concept associated with demons dating back to late antiquity. As for the trio of “fused goat-skulls for his head”, Kaiser states that these “take the conventions of religious iconography and twist and play with them to create something new and perhaps subversive”, though he also notes that they were “inspired by the Black Phillip character from the movie The VVitch“. And the backside of the form’s head is embossed with “a demonic seal”, the artist says, “a variation of the Seal of Saturn” as presented by Heinrich Cornelius Agrippa in his second volume of De Occulta Philosophia libri III. “The seal also has links to future releases within the Arcane Divination series”, Kaiser reveals, noting how every “detail is discussed and debated at length and nothing is accidental”, ensuring that “every angle of the narrative” conjoins to the larger whole. “For every demon, there’s [also] the other end of the spectrum”, series curator Jesse Yu mysteriously states, “and that duality will be explored with Jon’s Azazel release and another release that will be coming in early Spring”. Clarifying that this related piece is of his own design, Yu states that “Jon and I worked closely together on how to make our pieces work together as well as stand-alone on their own” with there being “shared elements between the pair”. Regarding the one aspect that hopefully will “set the tone for both the design and the theme of the Demon [Dunny]“, Yu draws attention to being “able to utilize some new production techniques, especially on the finish of the final product”. Regarding the marble-like pattern decorating his creation, Kaiser notes that the two color schemes were intended “to emulate ancient religious statues, icons of worship and figures of veneration”. The more readily available lighter version, which is limited to an edition of 1000 pieces, is inspired by “the Kintsugi texture”, Kaiser explains, “from the Japanese art of repairing porcelain with gold solder, emphasizing the breaks and making each piece unique and characterful”. The Kidrobot exclusive black-and-white rendition, limited to a mere 250 piece edition, “is a direct reference to the (possibly heretical) opulence of the statues, ornamental architecture, and lavish decoration of old churches”, the artist reveals. “To me”, he adds regarding these finishes, “this is quite a beautiful concept”, one which “contrasts strongly with the grotesque nature of the Demon [Dunny] and his tattered appearance, and hopefully lends it an ornamental feel”. 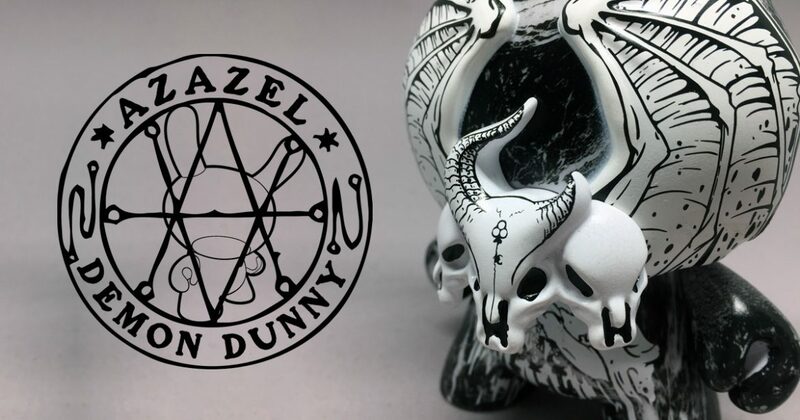 Click Here to Acquire Jon-Paul Kaiser’s 5″ Arcane Divination: Azazel Dunny from Kidrobot, or Click Here to Find a Kidrobot Retailer to Order it from.